The mother of the messiah has been called many things in the last 2000 years –the Virgin Mary, Our Lady, the Blessed Mother. But call her “the Mother of God,” and you’ll see some Christians squirm. This is nothing new. One day in the early fifth century, a priest preached a stirring sermon in the presence of the patriarch of Constantinople. His subject was the holy mother of Jesus. 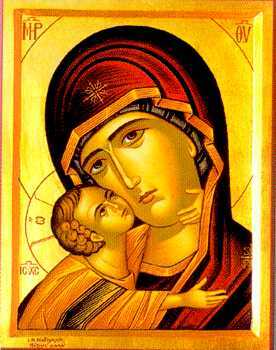 The preacher continually referred to Mary as the “Theotokos” meaning “God-bearer” or mother of God. This was no innovation–Christians had invoked Mary under this title for at least two hundred years. Nevertheless, at the close of the sermon, the patriarch ascended the steps of the pulpit to correct the preacher. We should call Mary the Mother of Christ, said Patriarch Nestorius, not the Mother of God. She was the mother of his human nature, not the mother of his divinity. His comment sparked a riot. And the dispute rocked not only the congregation, but the entire empire. Cyril, patriarch of Alexandria, Egypt, immediately recognized that Nestorius’ Marian theology was a symptom of a much deeper problem, a problem with the incarnation itself. For to deny Mary the title “Mother of God” makes of Jesus a dichotomy, a split personality. It would mean that God had not really embraced our humanity so as to become human. Rather, the humanity of Christ is hermetically sealed off from the divinity, as if Jesus were two persons, as if human nature was so distasteful that God, in Christ, had to keep it at arm’s distance. It is OK, according to Nestorius, to say that in Jesus, God raised Lazarus, or multiplied the loaves, or walked on water. But it is not OK to say that in Jesus God is born or that God died. Cyril, aware that this was a challenge to the heart of our faith, demanded that an ecumenical council be called to settle the matter. So in 431, the Council of Ephesus met, under Cyril’s leadership, and solemnly proclaimed that Mary is indeed rightly to be honored as the Theotokos, the Mother of God. It proclaimed that from the moment of his conception, God truly became man. Of course Mary is a creature and could never be the origin of the eternal Trinity, God without beginning or end. But the second person of the blessed Trinity chose to truly become man. He did not just come and borrow a human body and drive it around for awhile, ascend back to heaven, and discard it like an old car. No, at the moment of his conception in the womb of Mary, an amazing thing happened. God the Son united himself with a human nature forever. Humanity and divinity were so closely bound together in Jesus, son of Mary, that they could never be separated again. Everything that would be done by the son of Mary would be the act both of God and of man. So indeed it would be right to say that a man raised Lazarus from the dead and commanded the wind and waves, that God was born that first Christmas day and that, on Good Friday, God died. The Council of Ephesus, once confirmed by the Pope, became the third ecumenical council of the Catholic Church, and its teaching in this matter is dogma, truth revealed by God which all are bound to accept. So why does the Roman liturgy celebrate the Octave of Christmas as the Feast of Mary the Mother of God? Because this paradoxical phrase strikes at the very heart of Christmas. The songs we sing and the cards we write extol the babe of Bethlehem as Emmanuel, God-with-us. He is so with us that after Gabriel’s visit to the Virgin of Nazareth, the Divine Word can never again be divided from our humanity. What God has joined, let no man separate.